The 2018 NBA season ended with the Golden State Warriors defeating the Cleveland Cavaliers to win the 2018 NBA Finals. Now NBA teams and fans across the US are eagerly awaiting the 2018 NBA Draft where the league’s 30 teams will pick from among the top college players to fill out their rosters for next season. We'll tell you how to get an NBA Draft live stream wherever you are. 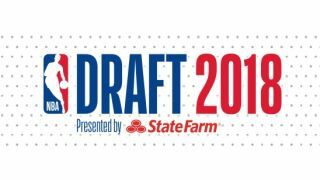 The 2018 NBA Draft will be held at 7pm EST / 4pm PT (midnight in the UK) on Thursday, June 21 at the Barclays Center in Brooklyn, NY. The NBA Draft is a system designed to bring new and upcoming players to the NBA from all over world. The first draft was held in 1950 and the process has continued every year since with 1980 marking the first year the draft was televised. In 2006, the rules of the draft changed so that players had to be at least 19 years old before they could join the NBA though college players who have finished their four-year college eligibility are automatically eligible for selection. On Thursday we’ll finally find out where prized college prospects such as Deandre Ayton, Marvin Bagley III, Trae Young and EuroLeague MVP Luka Doncic will end up. The Phoenix Suns won the recent NBA Draft Lottery, so they will have first pick followed by the Sacramento Kings, Atlanta Hawks, Memphis Grizzlies and Dallas Mavericks in the top five. There will be two rounds of picks consisting of 30 picks each with 60 in the whole draft. Each team will get one pick per round, though sometimes a team will pick more than once in a round or not at all. The 2018 NBA Draft will be the last to use the original weighted lottery system that gives teams near the bottom of the NBA draft better odds at the top three picks while teams higher up have worse odds in the process. This system will not be implemented in next year’s draft. If you’re a basketball fan in the US, Europe or anywhere else in the world, we’ll show you exactly how to watch the 2018 NBA Draft on either your television, computer or even on your mobile devices so you’ll know which teams to watch when the 2018-19 NBA season kicks off in October. If you live in the US and have a television and a cable subscription, ESPN is your best option for watching the 2018 NBA Draft live. The network’s coverage will begin at 7pm ET or 4:00pm PT on Thursday, and you can also live stream the draft on WatchESPN or via the WatchESPN app though you will have to login using your cable subscription details. If you’re a cord cutter without a cable subscription, there are a lot of options to stream the draft online using services that include ESPN such as DirecTV Now, Hulu with Live TV, Playstation Vue, Sling TV and YouTube TV. Sling TV is our recommended choice though as its $20-a-month Orange plan is the cheapest option and includes ESPN. Die hard basketball fans who already own or are considering signing up for the NBA League Pass may be able to watch every game during the regular season but unfortunately we understand that the 2018 NBA Draft will not be shown on the service. NBA fans in the UK with a cable subscription can watch the 2018 NBA Draft on BT Sport as it is the exclusive home of NBA in the UK. If you’re out and about during the draft, you can also watch it on the BT Sport app. You'll have to put the coffee on though, as the event doesn't start until midnight.